With a family skiing trip over the Christmas holidays, and my re-entry into the hockey world, I’ve begun to notice one thing popping up all over the place. 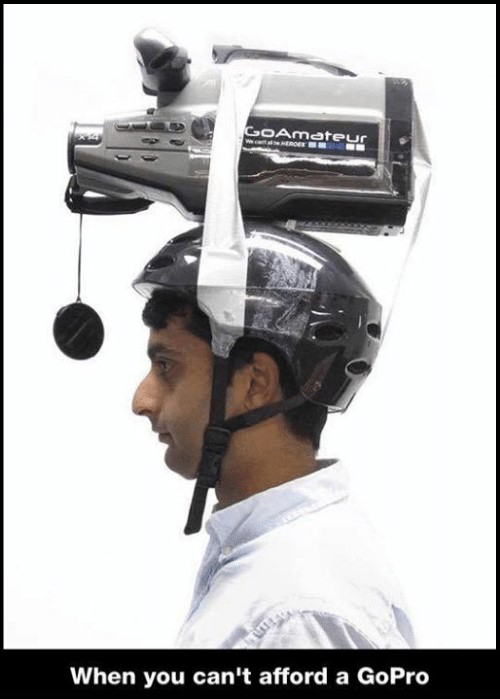 Or, more specifically, atop lots of heads: the GoPro camera. While there are other wearable camera companies attempting to topple GoPro, GoPro continues to top the list. It’s the Kleenex of wearable tech – and with its branding, it’s no wonder it beats the lowly Yi and TomTom. As GoPro CEO Nick Woodman notes, no one’s going to say “Check out my wild Apple videos!” The GoPro’s got that covered. GoPro got its start by befriending unlikely niche marketers: extreme sports fanatics. They have about 140 athletes working for them, and the job is simple: take a free GoPro, and share epic videos of everything you’re getting into – from solo BASE jumping to skiing near-vertical mountains to surfing legendary barrel waves. Every year, the company hosts a summit for its daredevils to share clips and shooting techniques. GoPro is awesome, not just because it shows extreme athletes doing their thing; it’s awesome because it gives us a vivid, first-hand experience of sports. And in that sense, it’s literally transforming the way we experience them. We don’t just watch BASE jumpers from afar now; we get to fly through the air with them. But, as GoPro President Tony Bates notes, there are only so many BASE jumpers in the world, which is why the company that made extreme sports mainstream is entering new territory, into the sports we regular folks know and love. Lucky for me, GoPro has decided to start with hockey. They’ve announced a long-term partnership with the National Hockey League (NHL), during which they plan to use GoPros throughout the rink and potentially on top of referees’ helmets for live broadcasts of games. And that’s not all – GoPro plans to go bigger and bigger: think cameras on top of NFL end-zone goalposts or behind NBA backboards for super close-ups of the perfect slam dunk. For now, I’m just working on returning to the ice. But, perhaps in the future, I’ll GoPro. Have you ever used one of these cameras? What do you like (or dislike) about filming your own adventures?